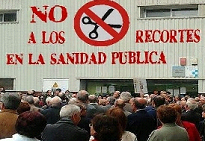 Protest group Indignadas x los recortes en Sanidad has produced a comprehensive map of the cuts to health services across the region. It makes for disturbing viewing. Catalunya protests labour law "reform"
The Grandparents Who Protest: the "Iaioflautas"